- Place the numbers 1 - 9 once in each row, column and 3x3 box in the grid. - In addition, the two major diagonals of the puzzle (marked in grey) must also contain the numbers from 1 - 9 exactly once. That's it! Armed with just those rules, you must place numbers in all the empty cells in the grid to solve the puzzle. 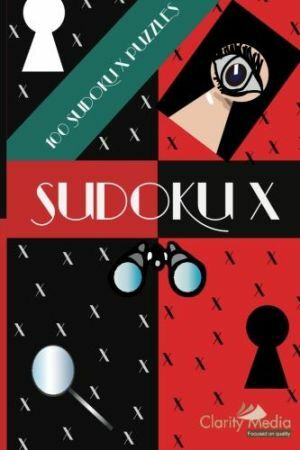 Sudoku X was the first variant of sudoku to appear on the market, and was promoted as sudoku with the X-factor, and other similar punny names. However, it has sadly disappeared from many publications in recent years, making it harder and harder to find. Therefore we decided to publish a book dedicated purely to this now neglected sudoku variant - we hope that if you're a sudoku X fan, you'll enjoy this collection of 100 puzzles! But what rules are required to solve the puzzle? Well, that's the joy of sudoku X - unlike some other sudoku variants that have some very complicated rules, all you do with sudoku X is to apply the standard rules, but to the two major diagonals too that form the 'X' region. 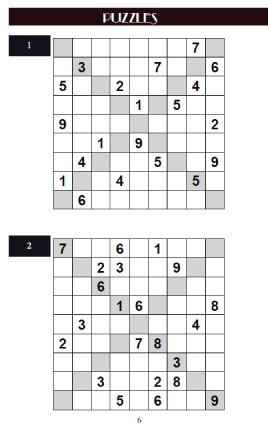 The key to success in sudoku X is to use these grey regions to solve the puzzle: most people get stuck when solving by forgetting to make deductions along the X's that are surprisingly powerful in aiding solving: indeed this can be seen by the fact that sudoku X contain less givens in many cases than standard sudoku puzzles. If you would like to try a sample before deciding whether to buy, then please do print off the sample puzzles linked to above: we've put six on this site free of charge so that you have a good idea of what the puzzles are like and how difficult they are. We hope you'll agree that they make a fun change from standard sudoku without being too different to the standard puzzle to lose that unique sudoku charm. If you have any solving tips or comments on sudoku X or indeed any other puzzle, then we would love to hear your thoughts, so please do get in touch with us!